New 19" format power strips (1 U high). Manufactured in high-resistance extruded plastic sections, with Bakelite connection bases. Reversible squares for attaching to 19" or non-standard vertical assembly. The construction in 2-base modules allows custom configurations. Internal connections on bronze bus bar. Power supply cable, 2.5 m long, in copper shielded with PVC coating and jack with combined ground pin (C4). Jack bases with child-safe obturator. Finish: power strip grey similar to RAL 7035. Assembly brackets: red similar to RAL 3020. Jack options: German standard (Schuko) and French/Belgian standard. 2 sockets with lighted bipolar switch. Attachment not standardised. 4 sockets with lighted bipolar switch. Attachment not standardised. 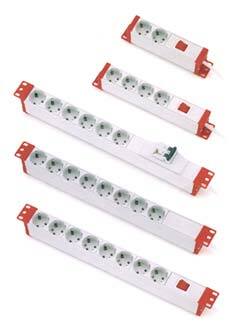 6 sockets with magneto-thermal circuit breaker. Attachment to 19". 8 sockets. Attachment to 19". 8 sockets with lighted bipolar switch. Attachment to 19". Code "19" U Socket N sockets Switch Thermal-magnetic C.B.